Canada Immigration benefits Canada is known for the natural beauty and scenic landscapes that it has. It is the home for thousands of immigrants from various countries who choose to be there because of the various opportunities it holds. Whether it is education or work, the options available in Canada will leave you spell-bound. No wonder people opt for this destination to immigrate. If you wish to settle abroad, you can apply for Canada immigration. The reason why it enthralls people to itself is that it has a stable economy, has a cosmopolitan outlook and the geographical features are simply breathtaking. Job opportunities in Canada are the major attraction for people from overseas countries. Right to live and work in Canada at any location of your choice. Availability of social benefits like public school education for children and state health care facilities for immediate family members. Shifting to Canada along with immediate family like parents, dependent children and spouse. A Canadian citizen can travel more than 100 countries without the need for obtaining a visitor visa. As a new Canadian Permanent Resident, you will enjoy the same rights as prerogatives as a Canadian citizen. 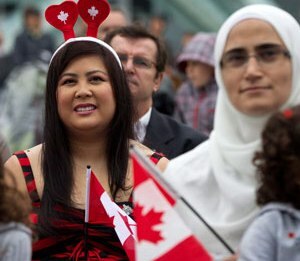 If a Permanent Resident lives in Canada for three years, he becomes a Canadian citizen. On loss of job, Resident gets financial aid of 2000 dollars per month. One year paid maternity leave (which can be shared by both the spouses). Canadian citizenship will allow you to study and work in USA, Australia, Middle East and Europe without the need for a visa. Canada is overall a quiet and safe place to settle, with a touch of the modern and old. It is a delightful place to live, with a sense of peace, harmony and brotherhood. For more Immigration updates follow MoreVisas Facebook, LinkedIn and Google+.